This talk was delivered as a faculty Lightning Lecture at the Brooklyn Institute for Social Research First Annual Institute Social on May 20th, 2017. What does it mean to have a body in the Anthropocene? The Anthropocene is a term that was coined by Paul Crutzen (an atmospheric chemist) and Eugene Stoermer (a biologist) in 1999 to refer to our current geological epoch. “Anthropocene” literally means “the time of humans”. The idea behind this name is that humans have so significantly altered the chemical and geological make up of Earth that they should now be considered the main driver behind global geological change on our planet. Our activities will show up as a characteristic band in the soil to the geologists of the future. As a social scientist who studies medicine and how people live in their bodies, my own interest in the Anthropocene concerns how this way of thinking about our present moment might make us rethink what it means to live as a body on planet earth. Bodily metaphors already abound in work about the Anthropocene, as in the work of geographer Jason Moore. Moore uses the metaphor of “metabolism” as one way to think the connections between human groups, nonhuman animals and plants, human economic activity, and Earth’s geology. To bring the metaphor back to its bodily origins, one way to think about the human body in the Anthropocene is in terms of metabolism. How does the body use energy? Where does this energy come from? How do energetic inputs and outputs connect the human body materially and ideologically to the world around it? Metabolism in this usage is a powerful schematic concept. It embeds one body in a system of other bodies and materials. Following those materials helps an observer to attend to the ethical, political, and economic connections that grow out of what one eats, how one eats, where one eats – and what, how, and where one excretes as well. Metabolism is not just an abstract metaphor or an analytic device. It is of growing concern in medical research and in public health in the Anthropocene. Medical science defines some kinds of human metabolism as “normal,” as “healthy,” and other kinds as disordered. Overweight, obese, and diabetic bodies are increasingly in the news as they are measured to be a larger proportion of the overall population of societies around the world. In the US, rising body mass index seems to correlate to a lack of financial resources. Carbohydrates and fats cost less than vegetables and high-quality protein. They taste good yet contain dense stores of energy – too much abundance for increasingly sedentary work and time-strapped lives. The stress of low-paying, long-hours jobs seems to compound the effects of our food, triggering cravings for more and encouraging storage in fat for the lean times our bodies believe us to be living in. In the Anthropocene, scholars have observed, industrial capitalists must work harder for less at the world-historical scale, fracturing rocks for oil and pouring rising amounts of pesticides on our fields. Expanding service economies operate along similar lines, demanding more hours from bodies for less pay. The consequences of this are borne in (some of) our bodies. Another way of thinking the Anthropocene body is through the metaphor of exposure. Exposure grabbed my interest during my 2013-2016 research on food allergy science and activism in the United States. Recently, I’ve been thinking about how exposure and a new scientific entity called “the exposome” fit into the story of the Anthropocene. Exposure is a prime concern in food allergy. In addition to genetic patterning, the timing and route of exposure to foods is thought to be a crucial factor in determining whether or not an apparently healthy infant will grow up into a food allergic child and adult. Increasingly, non-genetic hereditary factors, conditions in the womb, and the microbiome that colonizes the newborn in its first moments of life are considered part of the story as well. A new entity that encompasses all of these factors is called “the exposome”. The CDC defines “the exposome” as: “the measure of all the exposures of an individual in a lifetime and how those exposures relate to health. An individual’s exposure begins before birth and includes insults from environmental and occupational sources. Understanding how exposures from our environment, diet, lifestyle, etc. interact with our own unique characteristics such as genetics, physiology, and epigenetics to impact our health is how the exposome will be articulated.” This scientific concept, then, is conceived as a way to bring together multigenerational history (genetics and epigenetics), species being (physiology), an individual’s social and environmental context (environment and diet), and their particular life history (lifestyle, etc). The concept of the exposome connects the body to multiple scales of history, imbues it with subjectivity, embeds it in physical and social environments, and maintains interest in understanding the body’s inner workings – its genetic and physiological patterning. To me, this concept indicates a willingness on the part of health researchers to consider multiple forms of evidence about aspects of life that have not always been considered relevant to human health. Rather than reducing the complexity of life as a body to a few key biological indicators, a perceived sin for which social scientists have often critiqued Western biomedicine, this concept seeks to understand health and disease in a more holistic fashion. If the Anthropocene requires that we rethink and re- or decompose the traditional boundaries between fields of inquiry, as STS scholars like Donna Haraway and Bruno Latour have contended, then the exposome seems to me to be a site where this demand might be realized. As we at BISR join many other scholars around the world in reflecting upon what kind of scholarly inquiry might be appropriate for our individual and collective futures, I am encouraged by the irruption of capacious, synthetic concepts like “the Anthropocene,” “metabolism,” and “the exposome”. They seem to be sites around which different sorts of scholars, technical practitioners, artists, and activists can rally. They are problems which demand multiple disciplinary perspectives as well as new synthetic modes of thought. These conversations will shape the future of society and the Earth beyond the ivory tower, and so they need to involve practitioners and members of the public in addition to scholars and established political leaders. To know the Anthropocene body, then, requires sensitivity to its many contexts. It asks that we listen to and appreciate overlapping metaphors for describing its activities and significance. And it means a willingness to consider re-ordering scientific and humanistic knowledge to serve the people and problems that we face, together. 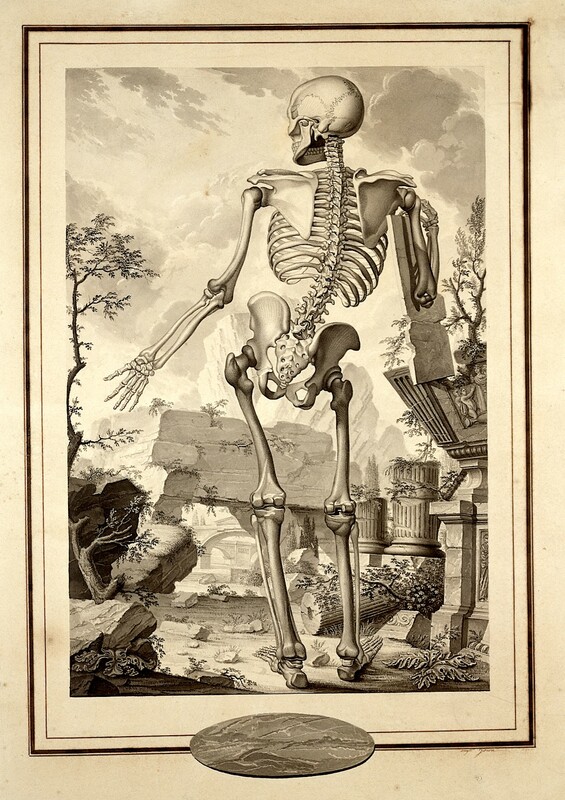 Image from the Wellcome Trust, CC license.